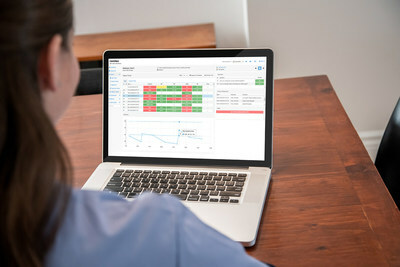 AUSTIN, Texas, Feb. 11, 2019 /PRNewswire/ -- Resideo Technologies, Inc. (NYSE: REZI) announced today a refresh of the company's LifeStream telehealth software platform to manage remote patient care. Enhancements in the latest LifeStream update include patient health surveys, a pain monitoring scale, nearly 100 educational videos, and an updated user interface to help healthcare professionals improve patient care, reduce readmission rates and drive efficiencies. 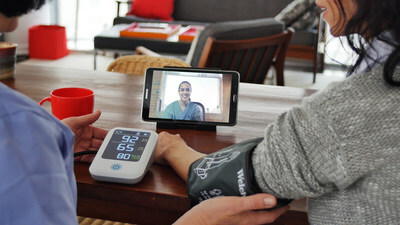 "Resideo Life Care Solutions has been a leader in the telehealth industry for two decades, and we continue to improve our LifeStream platform to enhance the user experience, and help drive better patient outcomes," said Scott Harkins, vice president and general manager of Connected Home, Resideo. "With our latest platform, as patients get discharged from the hospital their physician can now assign educational videos through LifeStream to help them understand their condition, and make choices that can impact their recovery. In addition, important vital signs, pain levels, and responses to clinical questions are captured and delivered to clinicians that monitor, triage and interact with the patient." Patient Health Questionnaires (PHQ) – PHQ screeners can be customized and assigned via a calendar-based scheduling interface, helping remotely monitor behavioral health and other conditions. Pain Monitoring – The industry-standard Wong-Baker FACES® Pain Rating Scale may be assigned to telemonitored patients dealing with chronic pain, enabling touch-screen, self-assessment of pain levels. Educational Videos – Care providers can choose from a library of educational videos provided by the Wellness Network, on some of the most common symptoms and conditions, to coach patients on how to better manage their health. Clinical Customization – Customized responses to vital sign readings to meet program and patient population needs. User Interface Improvements – Various enhancements include click-to-call a patient's primary care provider, inventory management improvements, and graphics that display patient outcomes over a timeline. Enhanced Web Browser Compatibility – Eliminates costly installation requirements. Care providers can access LifeStream's clinical dashboard from Microsoft Internet Explorer Microsoft Edge Web browser, or Google Chrome for Windows or Mac. The company will kick off a webinar training series beginning February 21, to showcase the latest updates to the LifeStream software platform. Please visit https://news.resideo.com/lifestream to register for the webinar. In addition, LifeStream 5.4 will be on display in the Resideo booth #7645 at HIMSS 2019 in the Orange County Convention Center, February 11-15, in Orlando, Florida. Resideo Life Care Solutions is a global leader in health management technologies and remote patient monitoring, providing the healthcare industry with integrated product and service solutions designed to improve the quality of patients' lives and reduce the cost of healthcare. For more information about LifeStream 5.4 and the entire Life Care Solutions business, please visit www.honeywelllifecare.com. Resideo is a leading global provider of critical comfort and security solutions primarily in residential environments, and distributor of low-voltage and security products. Building on a 130-year heritage, Resideo has a presence in more than 150 million homes, with 15 million systems installed in homes each year. We continue to serve more than 100,000 contractors through leading distributors, including our ADI Global Distribution business, which exports to more than 100 countries from more than 200 stocking locations around the world. Resideo is a $4.8 billion company with approximately 14,500 global employees. For more information about Resideo, please visit www.resideo.com.